BUENOS AIRES (Reuters) - Argentine President Cristina Fernandez met on Monday with Argentina bondholder and billionaire financier George Soros, who is suing a U.S. bank caught in the middle of the country's latest default. A spokesman for Soros said they had discussed topics including the energy sector. The meeting came as Fernandez's leftist government struggles to kick-start growth and contain runaway consumer prices after failing to complete a June interest payment to Soros and other holders of bonds restructured after a previous default. Soros' portfolio also includes a 3.5 percent stake in Argentina's state-controlled energy firm YPF (YPFD.BA). Buenos Aires has frequently cited the Hungarian-born magnate's investments in the country as a signal of investor confidence in the $490 billion economy. “President Kirchner and Mr. Soros discussed a range of topics, including the prospects for Argentina's economy, recent positive developments in Argentina's energy and hydrocarbons sector, and drug policy reform in Latin America,” said Michael Vachon, a spokesman for Soros, without giving further details. Local media had reported Fernandez would be looking to shore up support for her unflinching stance against a small group of investors whose decade-long debt row with Argentina triggered July's default. Fernandez is in the United States ahead of the United Nations General Assembly, as relations between Buenos Aires and Washington sour over the role a U.S. court played in Argentina's debt saga. Argentina plunged into its second default in 12 years when a Manhattan judge ordered trustee agent Bank of New York Mellon Corp (BK.N) not to pass a $539 coupon payment on to bondholders until the government resolved its fight with the small group of so-called holdout creditors. Those investors, led by NML Capital Ltd and Aurelius Capital Management, spurned the terms of restructuring after Argentina's record 2002 default on $100 billion and want full payment for bonds they snapped up on the cheap. Argentina said the judge had overstepped his bounds and repeatedly demanded BNY Mellon pass on the money. 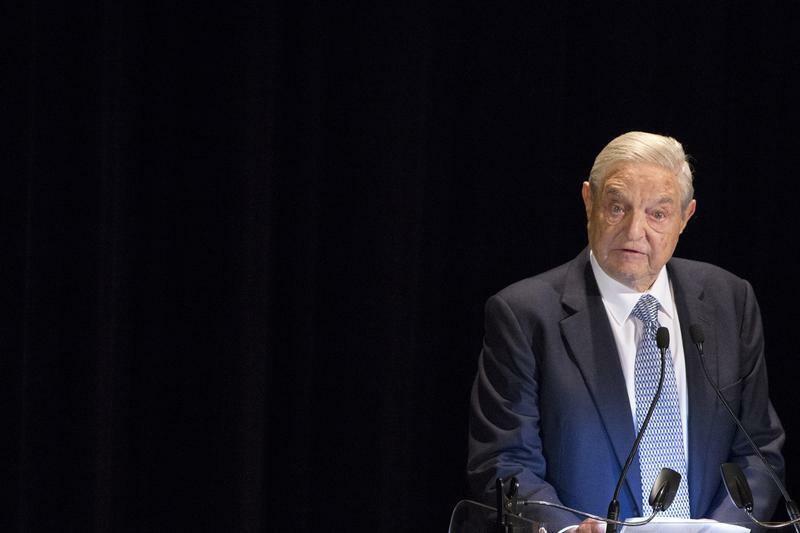 Soros' Quantum Partners hedge fund is one of four creditors that sued BNY Mellon in London last month, accusing the trustee agent of protecting its own interest by obeying the court. The other plaintiffs are Knighthead Master Fund, RGY Investments LLC and Hayman Capital Master Fund. Argentina last week enacted a new law removing BNY Mellon as trustee and replacing it with a state-controlled bank in Buenos Aires. In an advertisement published in local papers on Monday, Argentina again demanded the U.S. bank "resign" as paying agent. Index provider FTSE has cut Argentina from its frontier equity index, citing the country's stringent capital controls for its demotion to "unclassified market status." The change will take effect in June.